Solar Jobs in Texas Booming, but Where’s the Love? Solar industry jobs are expanding rapidly in Texas, despite a lack of supportive statewide policies. The Solar Foundation’s recently released Texas Solar Jobs Census 2014 shows that, solar jobs grew by more than 68% in Texas last year with over 2,800 new jobs created. That’s 3 times faster than solar job growth nationally, which is still impressive at almost 22% from 2013 to 2014. In contrast, overall job growth in the Texas economy was 2.8% from 2013 to 2014 – solar jobs grew 24 times faster. Nearly 7,000 Texans are now employed in the solar industry, putting the state in 6th place nationally for total solar jobs. Solar job creation is benefiting people of all different backgrounds, in a wide range of professions, including solar panel installation, electrical, roofing, managing, sales, project development, solar factory workers, finance, investment, insurance, consulting, human resources, administrative, engineers, research, marketing, media relations and communication. 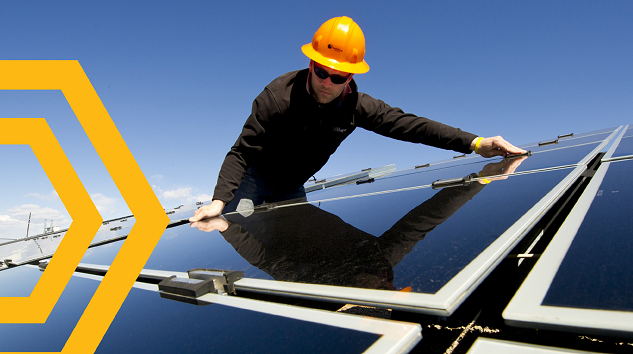 Workers earn an average of $20-24/hr in the fast growing solar installation sector. Solar designers and sales people and other professionals earn more.. Although women and African Americans are still under represented in solar jobs, hiring has increased among Latinos, Asians, African Americans, women and veterans. Solar jobs are generally skilled jobs that pay living wages. Texas’s abundant land, ample sunshine, and extensive transmission network make the state one of the top solar industry growth markets in the U.S. In addition, years of decreasing costs and growing scale are now enabling solar power to successfully compete against conventional energy to meet the growing demand in ERCOT. Despite the rapid increase in solar jobs, solar isn’t getting a lot of love in the Texas Legislature. Representative Stanford actually filed a bill that would entirely do away with Texas’ renewable portfolio standard. At a time when Texas oil and gas companies are laying off workers, shouldn’t state officials be commending industries that are adding good jobs at such a rapid rate, not trying to slow their progress? There are a couple rays of sunshine in the Texas House. Representative Farrar (D- Harris) has filed one solar-friendly bill – HB 706 – which would change the exemption application by a property owner of solar or wind powered energy to a one time application. Current law requires an annual application for an exemption, even though the exemption can be taken for the lifetime of the solar installation. HB 706 would reduce paperwork and administrative expenses. Representative Dawnna Dukes (D-Austin) is working with consumer advocates, developers, property owner associations, and the solar industry to develop legislation that will more fully protect property owners’ rights to install solar on their properties. Currently, builders can prohibit homeowners from installing solar for years while the rest of a development is built and sold. After that, property owner associations aren’t supposed to deny solar installations, but the law contains a loophole that some property owner associations exploit. Texas lawmakers should focus on finding ways to building on the existing momentum in the solar industry by solar options for individuals and businesses and not placing any extra barriers for utility scale solar to participate in the market.